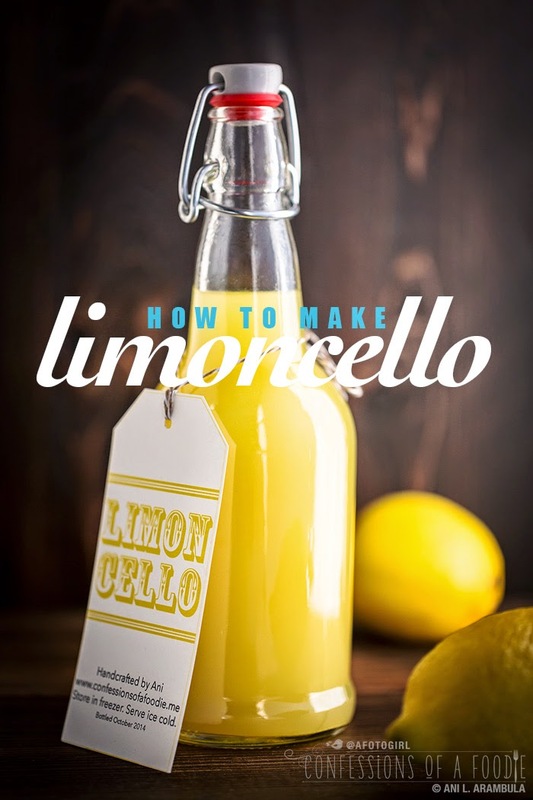 Make your own limoncello. It's simple and rewarding: You just need lemons, grain alcohol, time, and a little patience. The resulting elixir makes an excellent gift. I fell in love with Tuscany in 2003. That’s the year that “Under the Tuscan Sun” hit the theaters. Being a Diane Lane fan since I first saw her play Lauren in “A little Romance,” I’ve seen most, if not all, of her films. This one, well, this one has become one of those films that I go back to and watch again every couple of months. Do you have films like that? I have several. All romance. Why is that? Anyway, “Tuscan” reminds me that even when you think your life is unraveling, it’s actually just revealing who you really are and where you’re supposed to be; it’s in the unexpected that we have the potential to find ourselves and the happiness that we might be too afraid to wish for. There are, of course, several cooking scenes that I love. 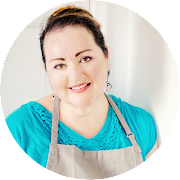 Watching as she nourishes herself by preparing huge family-style meals for her newly made family of strangers is the way I feel cooking for friends. It’s a trait I inherited from my parents. “What is it?” asks Frances. “Do you like it?” asks Marcello. Limoncello. I was intrigued. I had not heard of it before but I knew I had to try it. I went out to the market that following weekend and bought a small bottle of it, brought it home, poured a glass and immediately gasped. That was not what I was expecting! It was strong! I later learned you’re supposed to serve it ice cold, keeping it, like vodka, in the freezer. You’re also supposed to sip it, not drink it like you’re quenching your thirst. My second try was a much better experience and by the third taste, I was hooked! It also became a favorite addition to recipes while cooking. More on that another time. 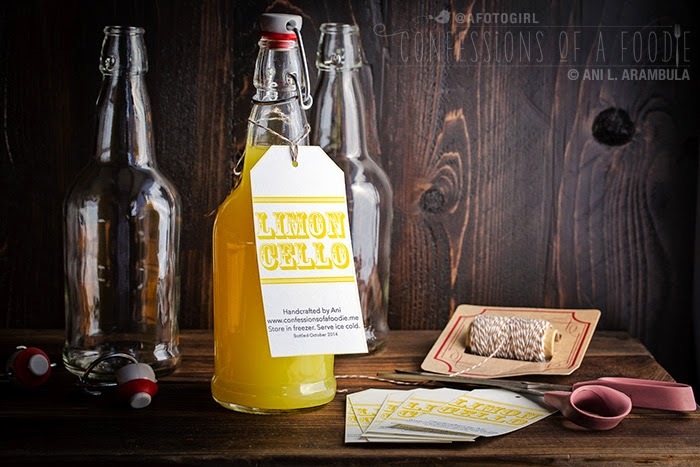 I’ve been wanting to make limoncello for Christmas gifts for years. With the success of last year’s DIY Christmas of Homemade Never-ending Vanilla Extract behind me, I decided this was the year for limoncello. Now, limoncello takes a little time and patience to make but once you get the first, more labor-intensive steps out of the way, it’s basically a do it and forget about it project. Well, at least for a few weeks until it’s time for part two and then again when it’s time for part three. You see, Marcello’s abbreviated description of his family’s recipe for this smooth (albeit, a little strong!) sweet and lemony elixir is not far off the mark. You basically steep lemon peels in a grain alcohol for 2 to 4 weeks, remove the peels, add simple syrup and let that rest for 3 to 6 weeks before bottling. So if you’d like to make this for Christmas gifts, you’ll need to get started in the next week or two. I used organic lemons to ensure that there was no pesticide on the lemon skins and gave them a good wash before peeling. 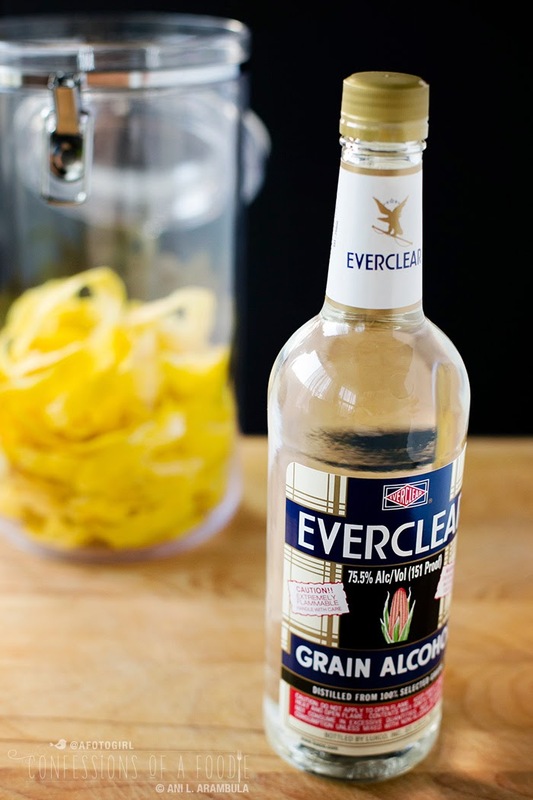 Some recipes call for vodka, others opt for Everclear to get the purest flavor. I used three 750ml bottles of 151 proof Everclear that happened to be on sale at BevMo. I found a good lemon to bottle ratio is 10 lemons to every 750ml of alcohol. Be prepared for the most awesome, lingering, lemony scent to fill your kitchen as you peel lemons! Last year for the vanilla extract, I bought my bottles from Specialty Bottle. They worked out great so I went back there to look for bottles for my limoncello. Typically, it’s served as an apéritif, ice cold straight from the freezer in a chilled shot glass and sipped. Since I am planning on giving this as gifts, I wanted it to feel like a substantial gift and decided that I needed to give at least 16 ounces away. Specialty Bottle has a 17 ounce swing-top bottle for $2.56 but it’s square and aesthetically – because I’m all about packaging – a square bottle wasn’t what I wanted. A quick Google search later, I wound up at Northern Brewer and found exactly what I wanted: 16 ounce round bottles with a swing-top cap sold in cases of 12 which brings the price per bottle down to $2.25. Compare that to a 17 ounce swing-top bottle at Container store that sells for $4.99 each and it’s a total steal! For tags, I opted to design my own on plain card stock, hand cutting them to size and tying them to the bottles using baker’s twine. 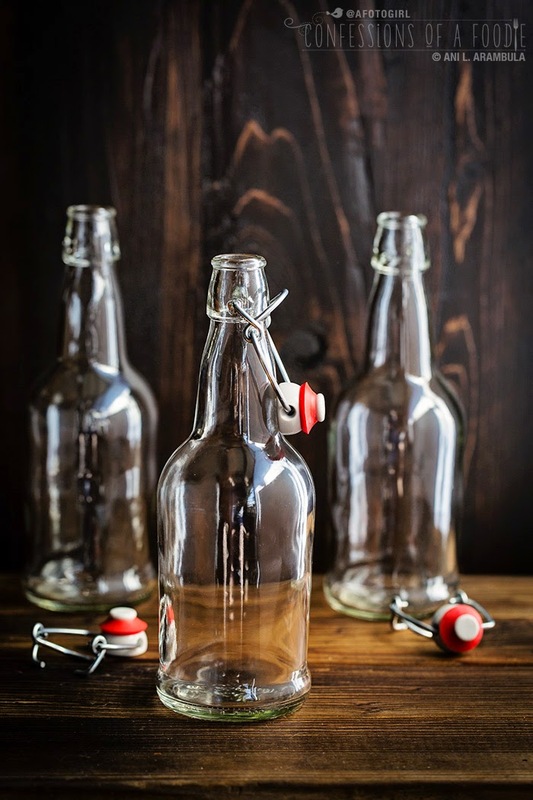 This way, the bottles can be re-used by the recipient for whatever they like without having to bother with scrapping off adhesive. After adding up my expenses, I think I’ve made out pretty well. I have 12 bottles to gift and my price per gift is just at the $10 mark. 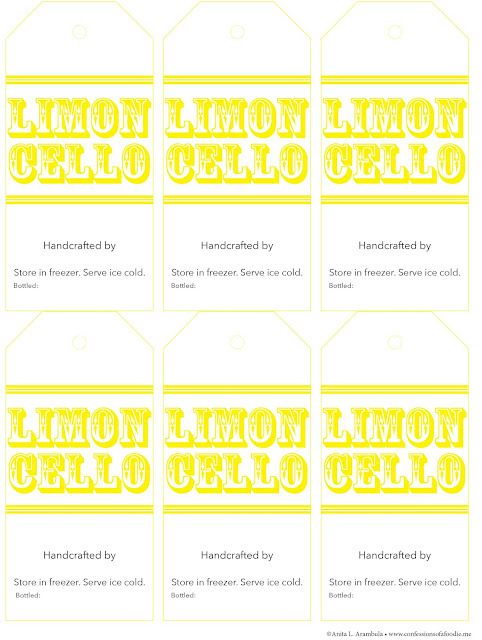 I am pretty excited to gift these and hoping that the friends that receive these bottles of lemony yum enjoy them as much as I enjoyed the process of making it for them. So, are you ready to make some limoncello? Let’s do this! I am giving directions for one batch which will yield approximately 2 liters of finished limoncello. I tripled this recipe. Just a side note, I found it fascinating when I took the container out of the closet, how incredibly deep orangey-yellow it was. Then, upon removing the lemon peel, I was surprised to see how much the alcohol had robbed the peels of their yellow coloring. The Everclear did an excellent job of extracting all that lemony goodness from the peels. Once the simple syrup was added to the jug, it turned this gorgeous, creamy, buttery yellow you see in the bottle photos. And the taste. Oh, yes please! 1. 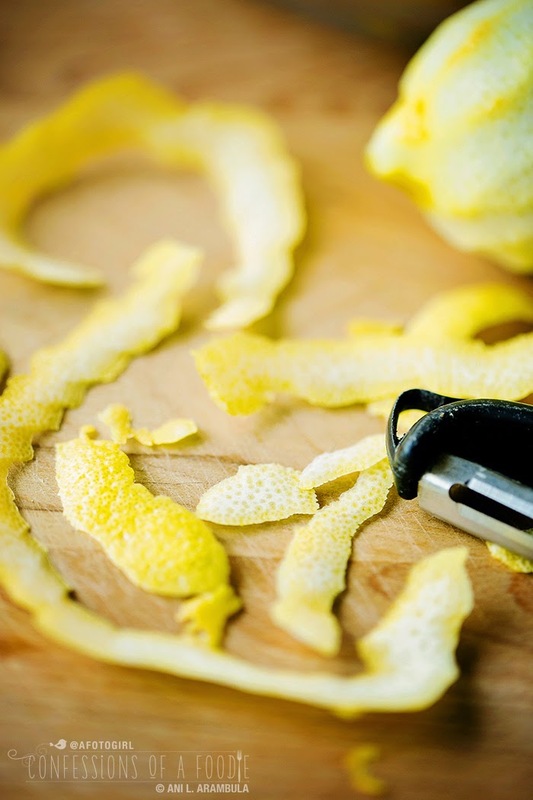 Using a vegetable peeler, carefully peel the yellow skin from the lemons. 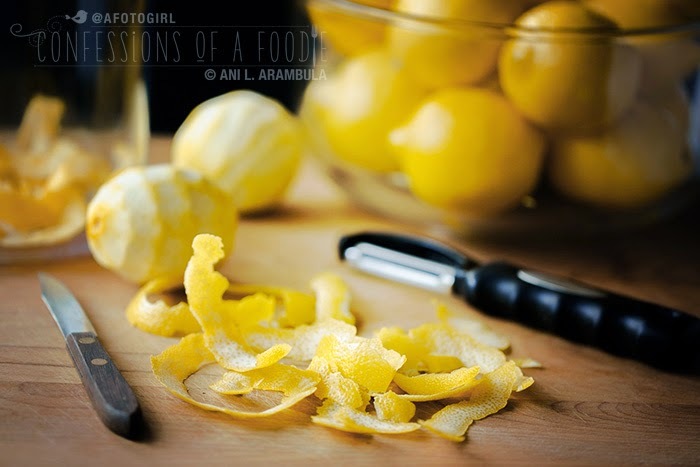 Instead of peeling them like potatoes, pushing the peeler away from you in an uncontrolled manner, gently pull the peeler toward you, rotating the lemon away from as you do so. This will help you control the peel, allowing for a longer, more paper thin peel, avoiding the white pith. If the peel has white pith on it, use a parring knife to gently scrape the white away. Drop peels into a one gallon container with a tight fitting lid. Repeat with remaining lemons. 2. Add the alcohol to the container with the lemon peels making sure to cover all the peels. Attach lid and store in a cool, dark cabinet to steep for a minimum of 2 weeks and up to 30 days. 3. 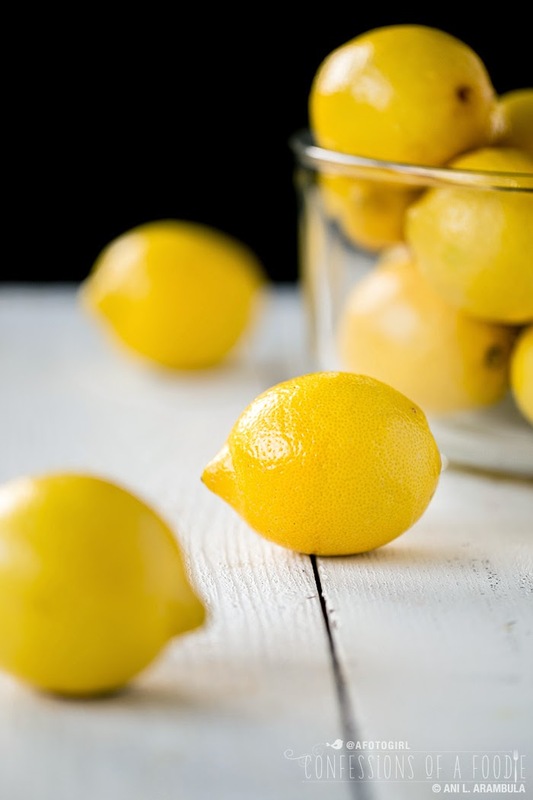 At the end of the steeping period, place a colander or large sieve in an extra large bowl and pour the lemon steeped alcohol in to strain out the lemon peels. Use a wooden spoon to squeeze any alcohol from the peels; discard peels and set bowl aside. 4. Pour the water into a large saucepan, add the sugar and simmer on medium until sugar dissolves, stirring occasionally to keep from burning. Once the sugar is dissolved, remove from heat and allow to cool for 15 minutes. 5. Rinse out the container you used to steep the lemons. 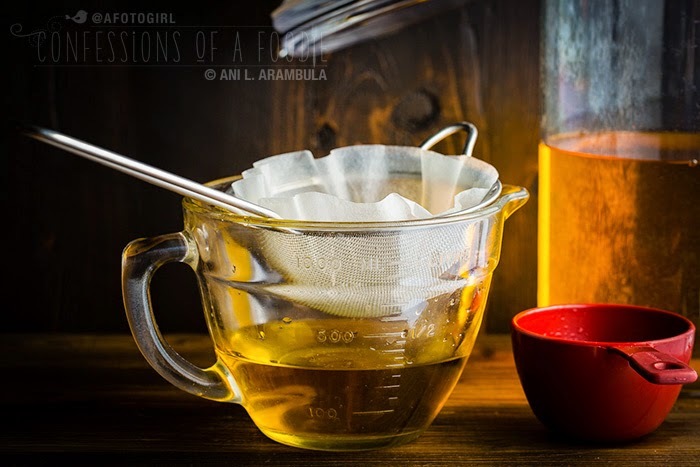 Place a coffee filter lined sieve over the container and working in batches, carefully pour in the strained alcohol. Replace coffee filter with a clean one and repeat process for the simple syrup, adding it to the alcohol. 6. Gently stir the limoncello with a wooden spoon, seal the lid and return to a dark cabinet to rest for at least 3 weeks and up to 40 days. 7. Place a coffee filter lined bottling funnel into a clean bottle of your selected size for use or gift-giving. Slowly pour in the limoncello. Seal bottle and decorate with a tag instructing recipient to store the limoncello in the freezer and to serve in chilled shot glasses. Repeat until your limoncello is all bottled up and ready to give away. Store bottles in a cool, dark cabinet until it’s time to gift. Until next time … Bottoms up! I've had several people email me asking for a copy of my bottle tags. So I thought I'd supply a downloadable copy for your use. Click on the photo then right-click on the image in the new window and save to your desktop. You can either print it out on 8.5 in. x 11 in. cardstock or onto a full sheet of Avery adhesive label and apply the tag directly onto your bottle (which is what I ultimately wind up doing). Enjoy! Really love your photography on this one! Great job, looks amazing. Ani, the vibrant colour is gorgeous. You've got me thinking about making some! I am a massive limoncello fan but never have made it myself before. Definitely need to recreate the recipe - it's such an awesome idea for Christmas gift giving! Thalia, I hope you have a chance to make this. I think they'll make such cool gifts this Christmas! Such an awesome hostess gift - and so easy! Love it! What kind of shelf life does this have, if stored in the freezer as instructed? It'd be nice to put an "enjoy by..." date on the bottle if necessary. Looks delicious! After adding the simple syrup, do you return to rest for another week for 3 weeks total or this step lasts 3 weeks? Thanks for the help! @Kathleen: If you're using Everclear and storing in the freezer or even the fridge, there really isn't an expiration. 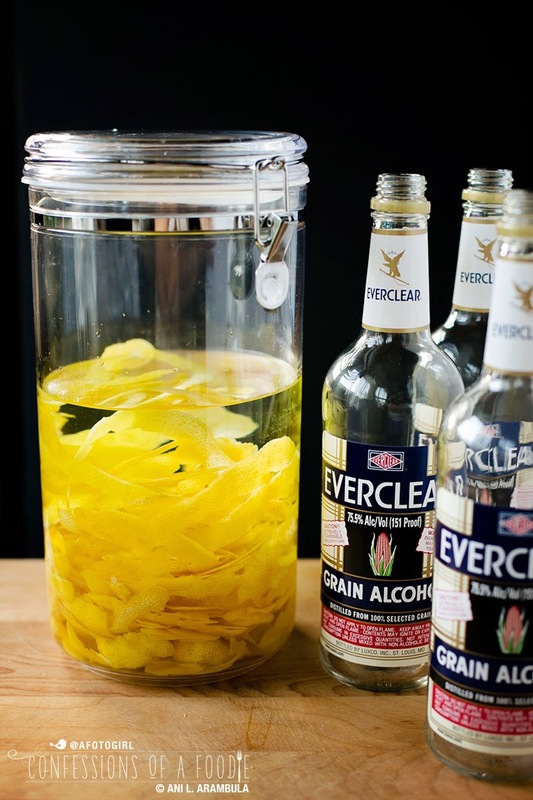 Everclear (or even 80 proof vodka, for that matter) is like a preservative as the alcohol inhibits growth of bacteria that would cause spoilage. Presumably, leaving it at room temp, so long as it's not in direct sun, it shouldn't spoil either before being consumed. If you feel the need to add a use by date, you could say will last, when stored in freezer for 5 years after opening. But I have had one of my bottles of store bought limoncello for 6 years (I lived alone for quite a while and use it mostly for baking/cooking and only the occasional shot) with no signs yet of it degrading. Is there any reason not to also use the juice recovered from the lemons after they are peeled? Is it a storage problem or a dilution problem? Hi Paul… It's a dilution problem. Limoncello is an infused liqueur. 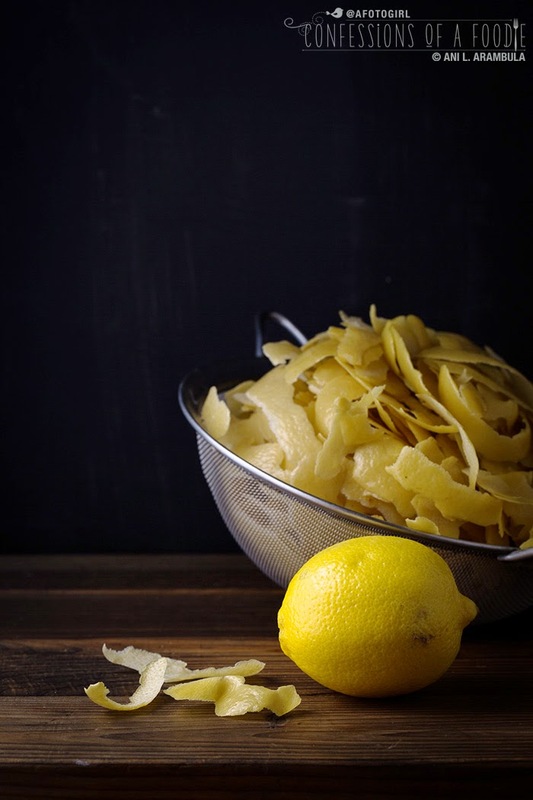 The grain alcohol (or vodka, if using that instead) extracts all the essential oil from the lemon zest which is what gives limoncello its color and flavor. The juice is simply not concentrated enough to add anything and would infect dilute the end result and, I've been told, could slow down the oil extraction. I used my juice for lemonade and homemade popsicles. After adding the simple syrup and returning to sit in the dark closet, I'm seeing a little separation after two weeks. Is that normal? should I just give it a stir once I open it in another week? Vinnie, yes, I'd stir it with a wooden spoon now and then let it sit another week. I haven't had separation on my two batches but I have had to shake my store bought limoncello a few times before use so I'm assuming this is something that can happen. My husband and I are visiting Italy in April and it will be the first time for both of us. I love limoncello and cannot wait to sip it while on our trip! I'm definitely making this when we get back. Jeuli79 -- Yay! have fun! Maybe I missed this...but what do you do with the actual lemons? Do you just use the peel? 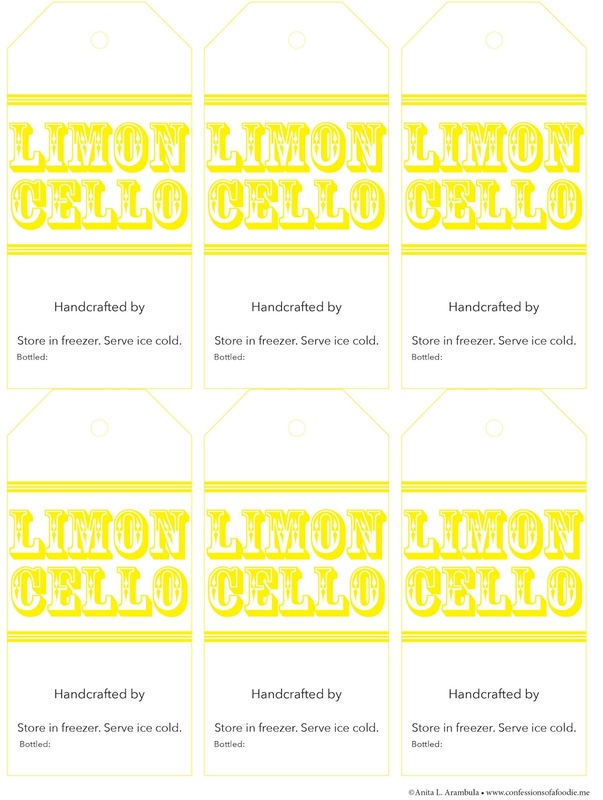 I love limoncello and I love the tag you designed. Any chance you would share the printable? Hi Kim, the actual lemon and lemon juice are not used to make limoncello. A few things I do: make a big batch of lemonade, squeeze and strain the lemons then pour them into ice cube trays to freeze for later use for cooking or baking, make sorbet (find one in my recipes tab) make lemon chicken, or make lemon curd or bars (I have a recipe for for both in desserts under my recipe tab). Hope that helps! If I'm using 191 proof ever clear (all I could find) would you recommend adding more water? Definitely! And you might want to up the sweetener some, too. Unfortunately, I can't give you exacts since I've not experimented before with the higher proof so you might need to try a small batch and adjust accordingly. Good luck! We were served limoncello after a meal in Greece and I loved it. We have since purchased a bottle and it was not the same. I definitely should try making it for myself. I hope you do! The beauty of making it yourself is you can control the sweetness... I have found some store bought limoncello to be too syrupy. Hello! I love this recipe! Question how many gift bottles does each one gallon container make? does it make 3 - 16 oz gift bottles or one? just trying to decide how many one gallon containers to buy for making my 10 - 16 oz. gift bottles. Thanks! I'm also trying to determine how many ounces/what the yield is of this recipe. The yield is noted at the beginning of the recipe: approximately 1.5 liters after all is strained (there is some evaporation that occurs which is why it's approximate). there are just shy of 34 ounces per liter so you're looking at about 67.5 ounces total. One gallon is 128 ounces (16 cups). Other than organic lemons, is there a certain lemon like Meyer that you use? Does it make a difference what kind you use? Thanks in advance! I, personally, wouldn't use Meyer lemon. I think that would be much too sweet. But that's my personal taste. However, I'm sure you could try it, especially if you grow your own. The beauty of this recipe is that it can be used to make any kind of citrus 'cello': orange, grapefruit, tangerine, so I don't see why not Meyer. I used organic Eureka lemons. I make limoncello using the Meyer lemons from my lemon tree. They make wonderful limoncello- could not notice a difference when compared to the limoncello sipped on a recent trip to Italy. Just bottled mine this weekend, and it is delicious. Getting ready to create the labels, but when I right click I can only save a jpg. Do you have a word document or something I can write in? Thanks. I'm so glad it came out great! Sorry, Holly, it is a JPG meant to have the "handcrafted by" handwritten by anyone who might be wanting the use of my label. As a pro designer, I use InDesign not Word for my graphics (I don't even own Word...). So I exported to JPG to. If you have the latest version of InDesign, I can email you my document. Otherwise, not being familiar at all with word, is it possible to place the file in a Word document as an image then create text boxes that can sit above the photo positioned below the "Handcrafted by" that you could type in? I'm just curious... WHY do you allow it to sit for awhile after you add the simple syrup?? Seems like there's nothing left to "marinate" if you will. That label you designed is so great. What size of Avery label do you use to create the adhesive version? Thanks! I used the full sheets which, for most projects I find it works best because I'm not locked into dimensions. I have a good paper cutter that I picked up inexpensively at Michael's that makes cutting them afterwards a breeze. I am in the process of making limoncello using your guidance. However, I'm wondering if you have ever tried making simple syrup with Splenda? I would like to reduce the calories if possible. I'm looking forward to your response! I have not. I don't use Splenda myself as I don't like the aftertaste. I use erythritol as my alternative sweetener. I haven't made a simple syrup yet with that but I've seen it online. The recipe for Splenda simple syrup I found says you'd use one to one just like sugar but it needs to be the bulk Splenda NOT the Splenda Baking. If you try this with Splenda, let me know how it comes out. Has anyone tried this with a 76 proof vodka? I'm in Canada and can't buy ever clean or 100 proof? I have a mambo lemon tree producing lemon/lime fruit. Presumably, I can use this fruit for the limoncello as it's been a heavy producer this year? I freeze the juice in bottles and it sounds like the perfect use for the peels. I just finished making mine - pulled it from storage and bottled it. Made it with good vodka because I didn’t have time to get the everclear and I had plenty of the very good vodka- was worried it wouldn’t taste as good but thank goodness it tastes fantastic!!! I think because it’s of the good quality of the alcohol and percentage as well. Anyway - love it!!! Great recipe! Didn’t come out dark like yours more clear but it is sooooo good!! It’s very yellow! And very lemony! ������ Thanks for the labels too!